Bell Lodge in Thorpeness, near Aldeburgh sleeps 6 people. 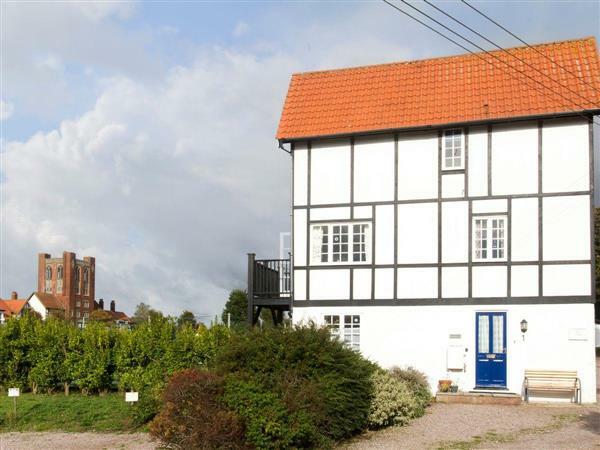 Bell Lodge near Aldeburgh is a three storey terraced house which is located in the grounds of Thorpeness Country Club, and is just a short walk from the beach. With French doors which open out onto a balcony that overlooks the country club’s tennis courts and gardens, the property is fresh and light. Featuring three bedrooms and an additional sofa bed, this cottage is great for a family holiday or a weekend break with friends. Visit the pretty seaside town of Aldeburgh, 2 miles away, with its fish and chip shops, art galleries and summer theatre. Southwold is a short drive away, and has a pier, shops and the famous Adnams brewery. The beach is 50 yards. With the shop, pub and restaurant 600 yards from Bell Lodge near Aldeburgh. Bedroom 2: With bunk bed and single sofa bed. Living/dining room: With 22 Freeview TV, DVD player and French doors leading to balcony. Electric storage heaters, electricity, bed linen, towels and Wi-Fi included. Travel cot, highchair and stairgate available on request. Welcome pack. Balcony with garden furniture. Private parking for 2 cars. No smoking. Holidays at Bell Lodge run from Friday to Friday. For a better idea of where Bell Lodge is, you can see Bell Lodge on the map below. Bell Lodge is in Suffolk; should you be on the lookout for a special offer, you can find all the special offers in Suffolk. It's always worth checking to see what is on offer at the moment. Do you want to holiday near Bell Lodge (UKC1229), you can see other cottages within 25 miles of Bell Lodge; have a look to find your perfect holiday location.